Security Doors are an important part of our business. Like Blinds, Security Doors, Screen Doors, Fly Doors and lastly, the good old Fly Screen have come a long way in a very short time. 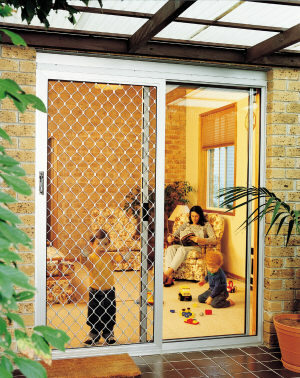 There is nothing wrong with an Aluminium Screen Door, as long as it is made to meet Australian Standards. Thousands of homes across Australia have the familiar diamond grille backed by either 1 way vision mesh, or fly-wire mesh. We offer a range of Security Doors and Window Screen and the Insect Screening markets. 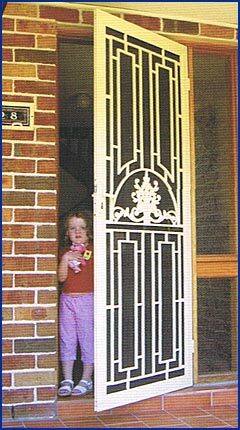 Many of the products in this range are designed to meet the strict Australian Standards for Security Doors and Window Screens AS 5039-2003 when assembled with components and in a manner in accordance with Australian Standards AS5039-2003. 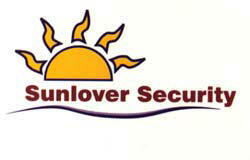 The range covers Hinged and Sliding Security Doors, Fixed and Operable Security Window Screens. All products are available in a broad range of standard colours or can be powdercoated to your specific requires upon request. 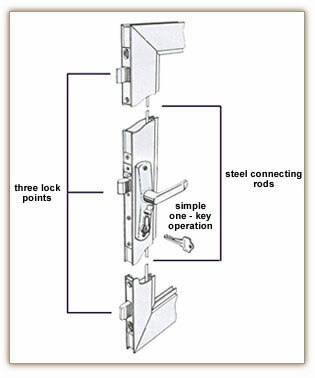 Triple Locks With Whitco's 3 point locking system or triple lock, one simple turn of the key locks your door in not one but three points and with the added security of steel rods connecting each locking point, it's the best security money can buy !